Has WTO lost its relevance in the multipolar and protectionist world? Examine in context of its BUENOS AIRES Summit 2017. Has the protectionist stand of the developed nations versus the assertiveness of developing nations rendered WTO handicapped? Discuss in context of the proposed plurilateral agreement on e-commerce. Is WTO heading for an extinction just like the erstwhile GATT? Discuss in the light of its 11th ministerial conference at Buenos Aires, Argentina in December 2017. “The failure to deliver a joint declaration after Buenos Aires Summit has raised questions about WTO’s ability to govern increasingly disputed global trade.” Elaborate. 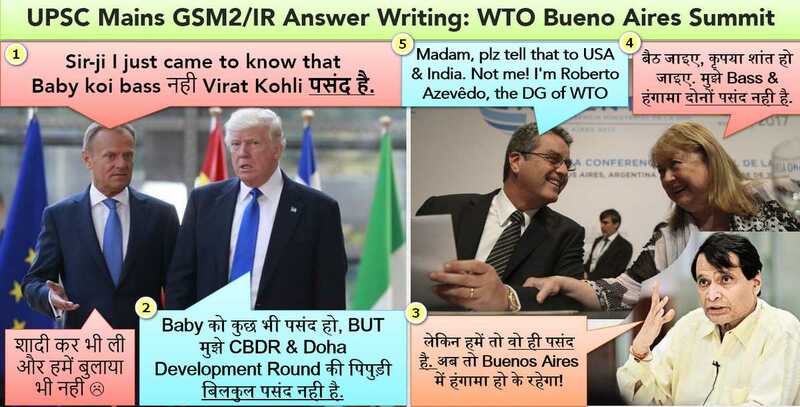 “The failure to deliver a joint declaration after WTO’s Buenos Aires Summit is a result of both USA’s stubbornness and India’s assertiveness” ” Elaborate. (GSM3) Explain “Peace Clause” and “Special Safeguard Mechanism (SSM)” of WTO, and discuss their present status in the aftermath of Buenos Aires Summit. 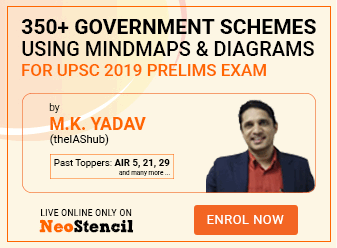 How are these questions relevant to UPSC Mains Syllabus? GSM2: Effect of Policies & Politics of Developed and Developing countries on India. GSM3: Farm subsidies and MSP and issues therein. First, get familiar with the basics of WTO from my lecture video. Those with IFS as first preference, get overly emotional and prepare this prepare in too much depth with ball by ball commentary. They fail to realize that in Mains exam such finer nuances and in-depth analysis is not asked. Besides even if you know everything, you can’t showoff your knowledge, because of the short word limit of 150-250 words in answers. Even in interview phase there is no guarantee that just because you’ve given IFS as first preference, panel will ask extremely technical question from economic diplomacy. So, don’t get FIXATED on doing Ph.D on every topic. Instead, let’s prepare some generic building blocks that can be used for handling any question related to WTO’s Buenos Aires summit (2017, December). If this question is asked in Mains-2018, it’s unlikely you’ll recall all the finer points to fill the answer-body in a vivid manner, therefore better we pad the answer by starting the ‘origin’ all the way from the inception of WTO, and its objectives and how its bi-annual ministerial summits are organized. ##: To be precise, WTO was born out of Marrakesh Agreement of 1994, and started functioning from 1/1/1995 but in real exam can’t expect to remember everything, hence generic introduction. Also observe how I wrote full forms of every time, so in the body of the answer, i can use abbreviation. Let’s try another approach: Instead of giving origin of WTO, we can write why this debate on “WTO’s irrelevance” has ‘originated’? (Introduction-Origin#2) In the present decade, there has been a rush among the nations to enact their separate bi-lateral and multi-lateral trade agreements outside the ambit of World Trade Organization (WTO). The proposed Transatlantic Trade and Investment Partnership (TTIP), Trans-Pacific Partnership (TPP) and Regional Comprehensive Economic Partnership (RCEP) are major examples of this phenomenon. Since i’ve framed 6 mock questions, i’ll simply give building blocks for the body. You prepare the customized answers just like DishTV’s A-la-carte packs. USA, EU and Japan feel aggrieved by China’s distortive trade policies such as- subsidies for state-owned enterprises, undervalued yuan, labour exploitation, stringent norms against foreign companies from entering domestic Chinese market, rampant piracy and counterfeiting of MNC products. While WTO’s dispute settling mechanism allows aggrieved parties to file cases against member-states. But some of the cases and issues have remained unresolved for a long time, and their permanent resolution requires changes in the trade agreements. A man is known by the company he keeps and the pipudi he dislikes. In the aftermath of economic crisis and refugee crisis, the political parties that favour nationalism, protectionism and anti-immigration policies against developing countries- have gained traction within EU member-states. President Donald Trump’s “America First” ideology is also of similar nature. Therefore, in international summits, both USA and EU have become more conservative and intolerant of developing nations. 1st world should liberalize their trade regulation further so that 3rd world’s goods and services can enter more easily in the first world’s domestic markets. 3rd world should be allowed to keep various barriers to slow down the entry of 1st worlds agriculture, mfg and service exports in their domestic market. 1st world should give financial and technical assistance to 3rd world. But in the latest summit (2017), US representatives even tried to block this mention of Doha-spirit! For the similar reason USA walked out of the Paris agreement on climate change, maintaining that it’s not in the best interest of American economy. WTO’s latest summit also aimed to streamline the national laws and regulations on e-commerce. Because already various bilateral and regional FTAs have covered E-commerce. So, it’d have been better to codify all those into a single and far-reaching agreement on E-commerce. But ‘e-commerce’ subject was not part of the original Doha agenda. So, India and others opposed it, saying “Doha subjects must be resolved first, before taking up new subjects”. Hence WTO’s latest summit couldn’t deliver a unified agreement on e-commerce applicable to all of its 160+ members. Instead, USA, EU, Japan and other likeminded countries decided to workout a separate plurilateral e-commerce agreement applicable to 70 likeminded countries. Later it may be expanded to other WTO-members. For similar reasons, discussions on investment facilitation, MSME etc. remained inconclusive- because India insisted that Doha topics must be cleared first before taking up new topics. Under WTO’s agreement on agriculture (AoA), member-states have to limit their food-subsidies to 10% of the value of agriculture production in 1986. India and other developing countries opposed it because to provide food security to their poor masses. So, during WTO’s Bali summit (2012) they were given immunity under a ‘peace clause‘, with the deadline of 2017. In other words, WTO had decided to resolve food subsidies related issues in 2017’s Buenos Aires summit at Argentina. But, USA/EU vehemently opposed farm subsidy reforms. They insisted that India and China must abide by their blueprint. Consequently, no consensus could be reached in the latest summit. While both first and third world nations need to reform food subsidies to improve international trade and to reduce rampant use of chemical input, but so far, WTO has failed to act as a facilitator / catalyst on this subject. Although in fairness, atleast all members agreed to address fisheries subsidies by next summit (2019). USA, Canada and other 1st world countries give 70-80% subsidies to their farmers on the cost of production. When such cheap agriculture commodities arrive in 3rd world, it ruin domestic farmers’ livelihood. Hence, India and others 3rd world countries want a Special Safeguard Mechanism (SSM), under which they can raise tariffs temporarily to deal with import surges or price falls in agriculture commodities. WTO’s Nairobi summit package (2015) had given ‘in-principle’ approval to SSM, but further details were to be finalized in Buenos Aires summit (2017)- but this too remained inconclusive. Aforementioned points prove that WTO has failed to resolve the basic issues in international trade. WTO’s predecessor GATT had failed because Most of the GATT decisions were made behind closed doors in ‘green room’ of the Director General- where 3rd world leaders were not routinely invited. Hence, GATT had lost credibility among the 3rd world nations. Therefore, WTO gives equal voting power to all members. All members have the right to be represented all the decision making bodies of WTO. All ministerial conferences work on ‘principle of consensus’ i.e. no member should formally object to a decision. and Trade agreements are implemented after ‘qualified majority’ e.g. The Trade Facilitation Agreement (TFA) required that minimum two-thirds of the WTO member-states must ratify before it becomes effective. In every trade agreement, 1st world has to implement reforms first, 3rd world is given relaxed deadline and LDCs are given special exemptions and handholding. So, WTO is a multilateral platform that provides equal voice to all, and takes special care of the poor nations. Multilateralism doesn’t mean you get what you want; it means you get what is possible. But, in the recent decades, both India and China have become economic powerhouses and therefore more assertive in all global treaties, whereas USA and EU have become more protectionist due to their domestic electoral politics. Hence it’s inevitable that WTO can’t function as smoothly as it used to in the past. It’s true that WTO’s Buenos Aires summit ‘failed’ to deliver a joint declaration of the member-states, but this is not the first time- Even in Seattle summit (1999) and Cancun summit (2003), no joint declaration could be worked out, nonetheless, WTO has functioned, successfully- It has settled various trade disputes among India, China, USA; and even delivered a landmark ‘Trade Facilitation Agreement’ at Bali summit (2013). The stalemate at WTO’s Buenos Aires summit is giving premonition to some experts that it’ll fail just like GATT. But, it’s too premature to sound the death-knell of WTO. Because, a global forum that works on the principle of consensus among all its members, should not be expected to deliver grant agreements and announcements after every summit, especially during a time when emerging economies have adopted assertive and developed economies have adopted protectionist attitude. Nonetheless, WTO has played a catalytic role in promoting international trade since its inception, and hopefully it’ll continue to do so in the future as well. After the grand announcements at UNFCCC’s Paris Summit (2015), the critiques said the same things on Marrakech (2016) and Bonn (2017) summit ke ‘कुछ मज़ा नही आया’ i.e. no grand announcements made. But, if you don’t expect even the best bowler to take hat-trick wickets in every match, then how can you expect an international body to give consecutive breakthroughs in every summit!? Mrunal Sir => True Rockstar!